Litespeed introduced the lightest frame in the world at the Interbike tradeshow in Las Vegas to the North American audience and the Ghisallo frame is now available to dealers in all sizes. 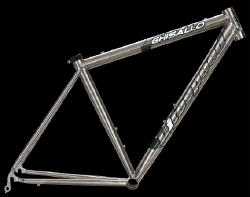 This new Ghisallo frame weighs apparently only 770 grams in size medium according to the folks at Litespeed. In the fall of 2001, Litespeed was one of the first bike manufacturers to go below that magic 900 gram barrier when they introduced the Ghisallo. Now they are attempting to set a completely new standard.